This is the center of the gravel pit. 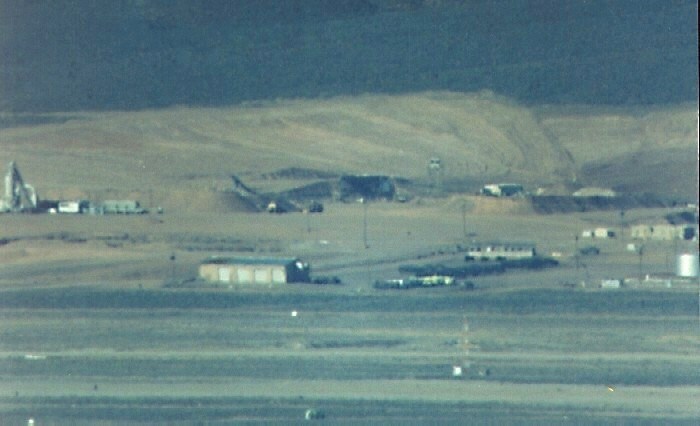 In the mid-ground is what appears to be an earth moving conveyer used in quarries. Either a water tower or a lookout tower is visible in the middle of the photo in the background. The building in the foreground is a fire station (building 615? ), or the POL (=aviation fuel) Filling Shed (Building 613). Several light green fire trucks can be seen to its right. To the left of the photo is a concrete plant. By the looks of it, they have everything they need to construct and demolish on site. The concrete plant was used in the construction of the new runway in 1992. It is now used to construct more buildings.